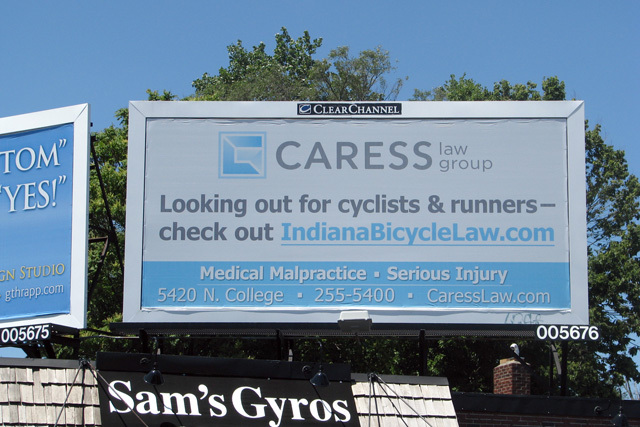 The bicycle accident attorneys at Caress Law Group are proud to reveal our new billboard located outside our office building at the intersection of 54th Street and College Avenue in Indianapolis! We are truly proud to be one of Indiana’s premier advocates for bicycle growth, safety, and legal representation. Whether you are located up north near South Bend, Fort Wayne, Valparaiso, Lafayette, or in the middle of the State near Indianapolis, Carmel, or Kokomo, down south near Evansville, New Albany, Jeffersonville, or Bloomington – or any where in between – we take great pride in calling ourselves bicycle lawyers and advocates, and we will always put our 100% effort into giving you or a loved one the best legal representation possible. We truly want to help you, no matter the situation. If you ever have any question related to bicycle law or Indiana personal injury or medical malpractice law, feel free to call us at 317-255-5400 or Contact Us to submit an online inquiry. All consultations are quick, free, and easy. Ride safe!